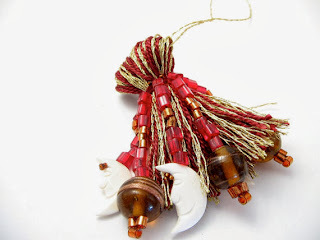 Welcome to Part Three of the inaugural edition of our Handmade Holiday Gift Guide! The ladies here at Huckleberry Love want to promote all of the amazingly talented handmade shop owners out there. So, we’ve rounded up 31 awesome shops to feature in this year’s Gift Guide. Each shop offers items that are individual, unique and handmade- perfect for gift giving! Be sure to browse through all of the great shops and take advantage of their holiday discounts that are being offered exclusively to our Huckleberry Love readers! We hope you find a plethora of new handmade shops that you absolutely love and will share with your friends! of the Handmade Holiday Gift Guide! Happy holidays- and remember, shop handmade this holiday season! About: Hi! I’m Jill. 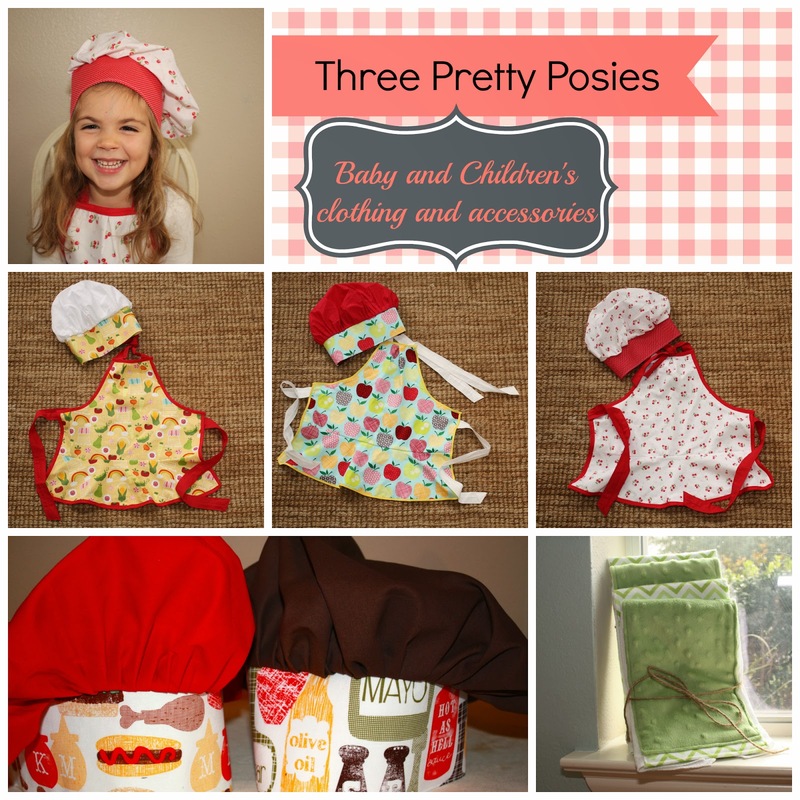 I’m a stay-at-home mom to three sweet babies who inspired me to sew. One of my favorite things to do is make homemade gifts. I started Three Pretty Posies so I could share some of what I enjoy making. I specialize in baby and children's clothing and accessories. These apron & chef hat are a favorite birthday gift for my kiddo's friends. Look for new baby mobiles, pillowcase dresses, and burp cloths. Also, I am now offering personalization on all items. 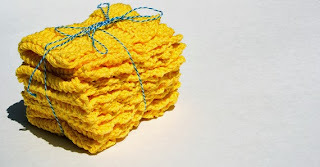 Stop by my shoppe, check out the items I have listed, and be sure to favorite Three Pretty Posies so you can come back and see what I've been up to! Feel free to e-mail me with any ideas and custom order requests! About: Hey there! Let’s be Friends. My name is Heather. Nestled in the trees of the Pacific Northwest I am a wife of ten years, mother of - one 4 year old son, full time property manager by day, with a sewing addiction at night. A lover of all things handmade, nature, coffee, dark chocolate, running to stay fit, my faith, holidays, seasons, and love. I am the creator behind HartFelt by iHart, maker of woodland ornaments, plush art, and baby mobiles from quality eco friendly felt. From my own designs, that are hand drawn, hand cut, & hand sewn, contains a piece of my ʺhartʺ in each one I make which comes to me as a blessing & joy I didn't know was missing in my life until I began creating. About: I've always imagined pieces worn by characters from literature, heroines and adventurers of history and fiction, and even reinvented my own jewelry collection because it was simply not ME. I make pieces for those women (and men!) who aren't part of the mold, don't want cookie-cutter jewelry and accessories because THEY aren't cookie-cutter either. While my educational background consists of art history, genetics, anthropology, and forensics, it's my dabbling in art and DIY that has allowed for me to take my visions of what jewelry should DO for the wearer and make pieces which are both relevant today and will be decades from now. 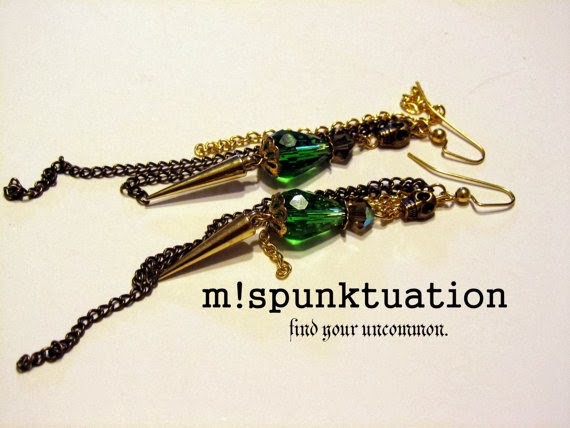 Ranging from light-weight simple neck pieces to be layered, metallic bejeweled body chains with ethnic flair, and hand-sculpted pieces that are a bit more eccentric, m!spunktuation is both edgy and rebellious. Bones and blood cell necklaces, Game of Throne-inspired rings, and pieces with mixed elements can only be found here. With every piece, I encourage everyone to find their uncommon. 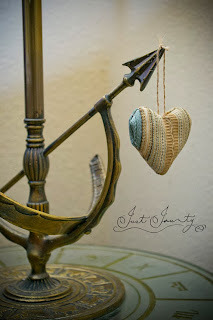 About: I am a stay at home mom who has been crafting for years. I have 2 young daughters. I enjoy spending time with them and they love wearing all my Handmade Goodies! I love making Tutu's, Hair Bows, Hair Accessories, anything girly! I can custom make my items to match anything! I recently opened an Etsy shop. I also have a Facebook page for my local shoppers. https://www.facebook.com/karlasfashionable.gifts I make bows for Holidays, Day to Day wear, Toddler & Youth Girl Pigtails, Beauty Pageants, just about anything you can think of. 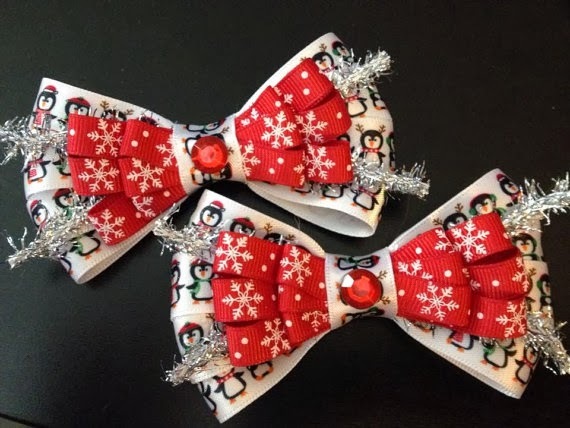 Your Special Discount: Visit Karla’s Bowtique now thru December 15th and receive 10% off of your order with the code BOWS10. And, receive FREE shipping on orders of $25 of more with the code HOLIDAY2013 thru December 30th. Your Special Discount: Stop by The Dahlia Scene now thru January 31st and receive 20% off of any purchase with the code CHRISTMAS. About: I live in Idaho Falls, Idaho. I am a writer and a crafter. I love to garden, and I grow many of the flowers found in my potpourris. My beaded tassels make fantastic gifts. I make ornaments, wall hangings, keychains, graduation tassels, tassels for potpourri sachets, fan pulls, jewelry, potpourri, dried and pressed flowers, art collages and more. All my potpourri uses the freshest ingredients. I make both homegrown potpourri, simple flower potpourris using flowers from my own garden, like pansy potpourri and rose potpourri; and artisan potpourri, using fruit, flowers, and essential oils to create a visually and aromatically pleasing arrangement -- I have apple pie, orange pomander, lemon lime, lavender, cedar, and more. Your Special Discount: Visit Lizbeth’s Garden now thru December 31st and receive 15% off of all orders over $5 with the code Christmas2013. About: Well, I am from Italy, and my day job hasn't anything to do with arts, unfortunately. That said, since I was a teen I had a passion for photography. I began taking photographs with an old russian made Zenith camera that my father once gave me, and since then I never stopped. 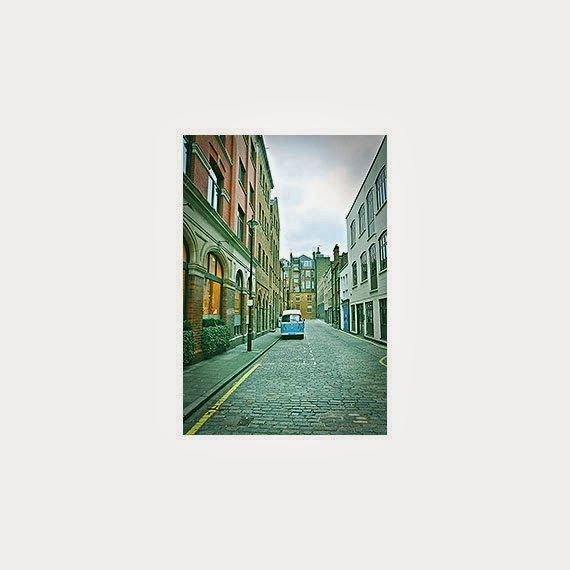 At first fascinated with landscape and nature photography, in the last few years my subjects changed a bit, and I'm now interested in street and travel photography, as well as candid portraits. I like to photograph anything that spurs an emotion in me, and I always try to convey that emotion to anyone is looking at my photographs. Your Special Discount: Stop by FM Photographs now thru December 31st and use the code HUCKLEBERRY13 to receive 10% off of all photographs. I'm a fan of living green, so my packaging is made from recycled materials - even the ribbon. I don't use strong acids in my studio anymore, only vinegar. I also plant a tree for every piece I sell. 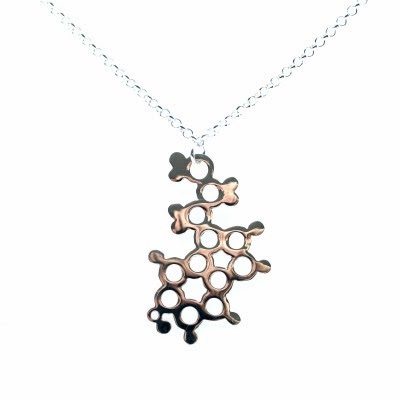 My work is inspired by happiness, love, passion and the science behind them - I make jewellery that represents molecules like serotonin and dopamine. But, I approach my subject from an artistic foundation rather than a purely science angle. I studied silversmithing at university and pride myself on creating very high quality pieces and commissions for my customers. Your Special Discount: Shop Emily Alice Black Friday thru Cyber Monday receive 10% off of all orders with the code huckleberry. About: I started my shop a couple of years ago when I was going through my collection of vintage sewing patterns. I have always had a deep love for vintage sewing patterns ever since I got my very first one from my grandmother over 5 years ago. Since then I have been collecting them, but my collection has grown to a point where I wasn't truly cherishing the ones that I have. So I wanted to share them with others. Since the birth of my son in August of 2011, I have been much more motivated to get my shop growing. I adore sewing and that is the main focus of my hard work. I find sitting at my sewing machine immensely therapeutic and I could sit there making things for hours on end. My hope is that people will cherish each and every one of my creations as much as I cherish making them. What You’ll Find: I love making things for little ones, especially car-seat blankets, clothes, and backpacks for toddlers. 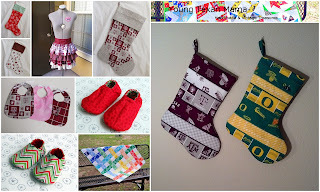 During the Holiday's, you can find Christmas stockings, tree skirts, and more. Your Special Discount: Visit Young Texan Mama now thru December 15th and receive 10% off of your purchase with the code HHGG10. About: My name is Michelle Brown. I graduated Humboldt State University with a bachelors degree in Studio Art in May 2009. I've been making art and crafts and sewing since I was younger. I just recently started to make jewelry. My shop is new, but I will be adding more items this month. 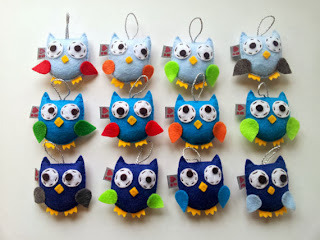 I expect to add a lot more hand sewn ornaments in the next week or so. What You’ll Find: Unique handmade ornaments, jewelry and gifts. Your Special Discount: Shop at Just Jaunty now thru December 26th and receive 20% off orders of $10 or more with the code HOLIDAY2013. Your guides have some fab shops!